I'm sad to say that this optics focal length thing is really confusing for this astronomy 101 guy, darn it. Question regarding my 10 inch reflector, Am i doing something wrong in that each time i drop in a higher magnification eye piece whatever i'm looking at grows darker and darker. I have the correct collimator eye piece for it and i always check and or adjust the mirror before every use of the scope. Am i doing something wrong. THX1138 wrote: I'm sad to say that this optics focal length thing is really confusing for this astronomy 101 guy, darn it. Question regarding my 10 inch reflector, Am i doing something wrong in that each time i drop in a higher magnification eye piece whatever i'm looking at grows darker and darker. I have the correct collimator eye piece for it and i always check and or adjust the mirror before every use of the scope. Am i doing something wrong. :? What you're observing is normal. From any particular area of the sky, your telescope is only capturing a certain number of photons. Increase the magnification, and you're spreading out those same photons over a larger area of your retina. So the surface brightness has to decrease. A larger aperture allows you to reach a higher magnification before the brightness begins to drop below what you'd see with your naked eye, but once you reach that point of magnification, it will happen with any scope. A new animated video of dwarf planet Ceres, based on images taken by NASA's Dawn spacecraft, provides a unique perspective of this heavily cratered, mysterious world. The video is based on observations of Ceres that were taken from Dawn's first mapping orbit, at an altitude of 8,400 miles (13,600 kilometers), as well as the most recent navigational images taken from 3,200 miles (5,100 kilometers). Data from 80 images are combined into the video. Analysis of overlapping images provided three-dimensional detail. The vertical dimension is exaggerated by a factor of two in the video. Does anyone know what IDA in the Dawn image credits stands for? It also shows up in the Rosetta credits and many other places as well. MPS is the Max Planck Institute for Solar System Research and DLR is the German Aerospace Center (Deutsches Zentrum für Luft- und Raumfahrt). The only thing I've found for IDA that makes any sense is Instrument Center for Danish Astrophysics (IDA), but I'm not sure that is it. Thanks, don't understand where "IDA" comes from (IDK maybe), but that link certainly makes more sense than the Danish one. Heh, yeah, that's a pretty nonsensical acronym. 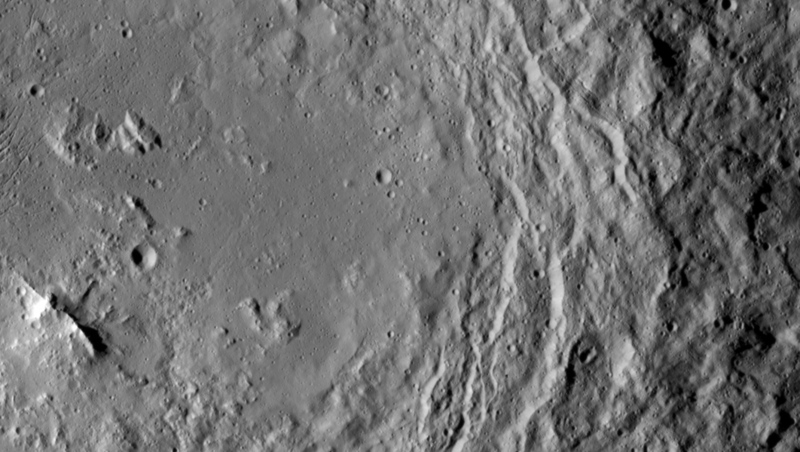 highs and lows of topography on the surface of dwarf planet Ceres. 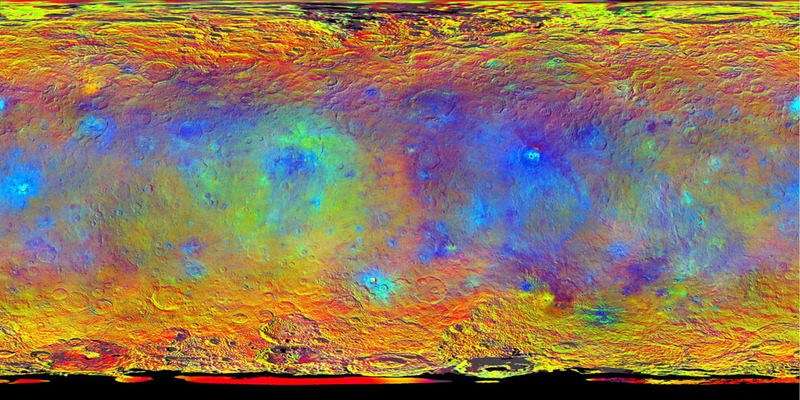 Colorful new maps of Ceres, based on data from NASA's Dawn spacecraft, showcase a diverse topography, with height differences between crater bottoms and mountain peaks as great as 9 miles (15 kilometers). Scientists continue to analyze the latest data from Dawn as the spacecraft makes its way to its third mapping orbit. "The craters we find on Ceres, in terms of their depth and diameter, are very similar to what we see on Dione and Tethys, two icy satellites of Saturn that are about the same size and density as Ceres. 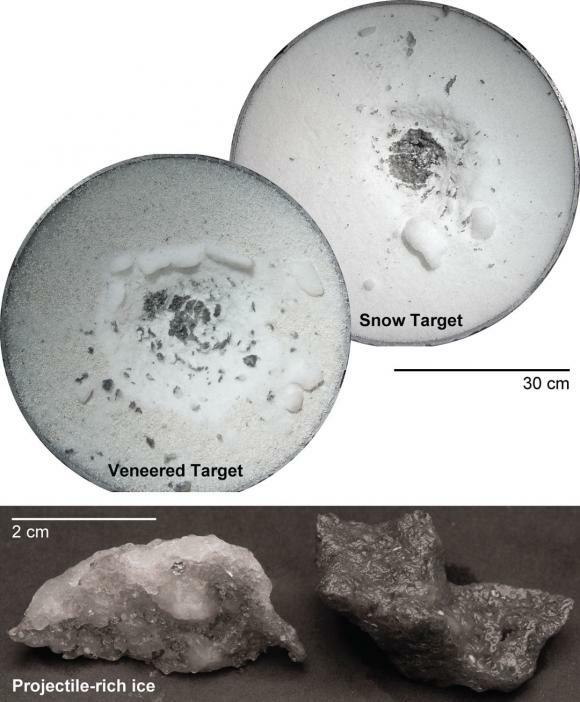 The features are pretty consistent with an ice-rich crust," said Dawn science team member Paul Schenk, a geologist at the Lunar and Planetary Institute, Houston. and often even extremely embarrassing. 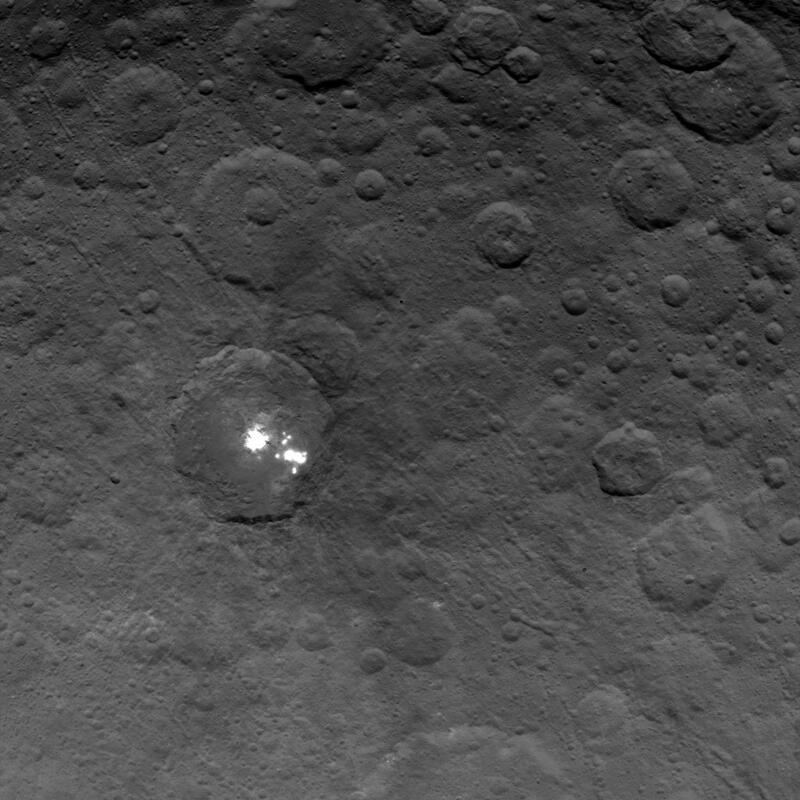 "The bright spots in this configuration make Ceres unique from anything we've seen before in the solar system. The science team is working to understand their source. Reflection from ice is the leading candidate in my mind, but the team continues to consider alternate possibilities, such as salt. 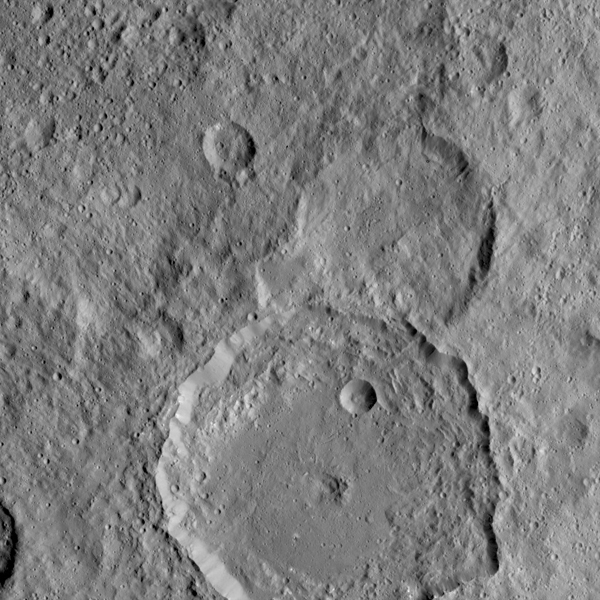 With closer views from the new orbit and multiple view angles, we soon will be better able to determine the nature of this enigmatic phenomenon,"
The closest-yet views of Ceres, delivered by NASA's Dawn spacecraft, show the small world's features in unprecedented detail, including Ceres' tall, conical mountain; crater formation features and narrow, braided fractures. "Dawn is performing flawlessly in this new orbit as it conducts its ambitious exploration. The spacecraft's view is now three times as sharp as in its previous mapping orbit, revealing exciting new details of this intriguing dwarf planet," said Marc Rayman, Dawn's chief engineer and mission director, based at NASA's Jet Propulsion Laboratory, Pasadena, California. 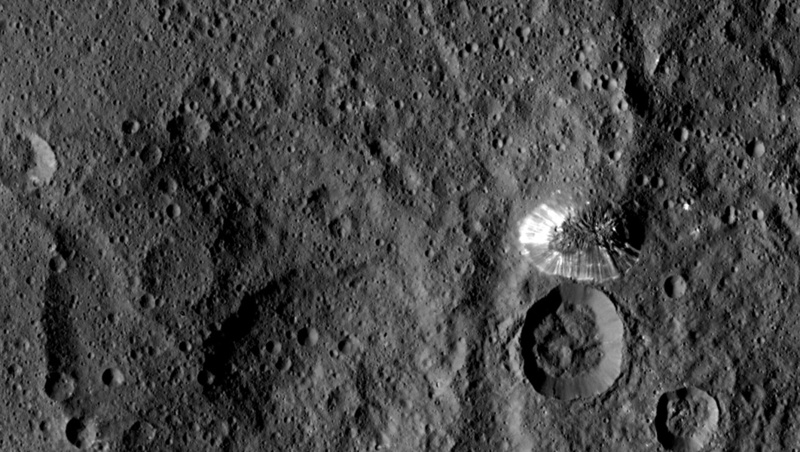 At its current orbital altitude of 915 miles (1,470 kilometers), Dawn takes 11 days to capture and return images of Ceres' whole surface. Each 11-day cycle consists of 14 orbits. 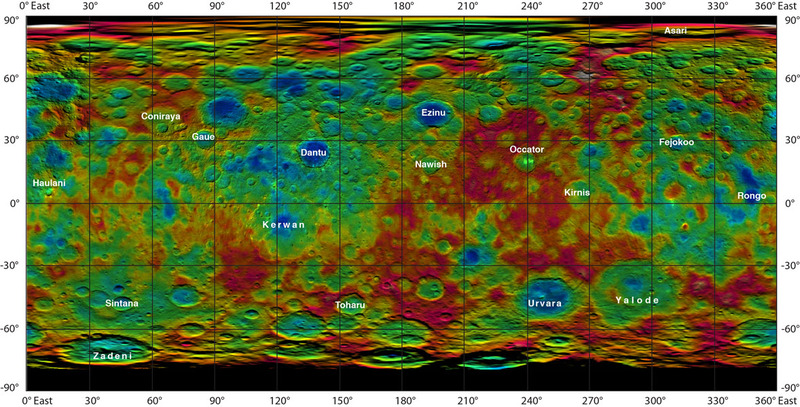 Over the next two months, the spacecraft will map the entirety of Ceres six times. The spacecraft is using its framing camera to extensively map the surface, enabling 3-D modeling. Every image from this orbit has a resolution of 450 feet (140 meters) per pixel, and covers less than 1 percent of the surface of Ceres. In Garrett P. Serviss' Edison's Conquest of Mars (1898), the Martians from H.G. Wells' The War of the Worlds (1897) are engaged in a war with giant beings from Ceres. Ceres is mentioned in some of the stories of Isaac Asimov, who usually situates an observatory on Ceres, as for example in the juvenile novel Lucky Starr and the Pirates of the Asteroids (1953) and the Wendell Urth mystery "The Dying Night" (1956). In Alfred Bester's book The Stars My Destination (1956), the main character claims to be a wealthy lord from Ceres. In The Dune Encyclopedia (1984), Ceres becomes the "Seat of the Empire" (i.e., capital) after Earth is hit by an asteroid. In Larry Niven's Known Space stories (1964 onward), the asteroid belt has a government based on Ceres. It is also the site of the narrow but deciding victory against the Kzin Fourth Fleet during the First Man-Kzin War. In Jerry Pournelle's Exiles to Glory (1974, republished 2007) Ceres is the site of an interplanetary mystery involving the theft of asteroid-mined super-heavy metals. 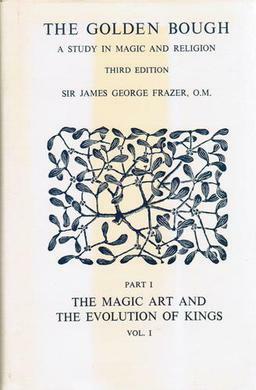 In Bob Shaw's book The Ceres Solution (1981), extraterrestrials attempt to use Ceres to destroy Earth's moon thereby removing the effect of "third-order forces" that have been stunting human development since the dawn of civilization. In L. Neil Smith's novel The Venus Belt (1981), Ceres contains a large underground city and several small settlements and stations, connected by a network hi of inverted highways. * In Bruce Sterling's novel Schismatrix (1985), Ceres Datacom News is a quasi-national entity networking the communications of the cybernetically enhanced inhabitants of the asteroids. In S. M. Stirling's Draka novel The Stone Dogs (1990), the Alliance for Democracy has a large base on Ceres. In Marooned in Realtime (1986) by Vernor Vinge, one of the murder suspects is the holder of a PhD in Mayan archaeology from the Universidad Polytecnica de Ceres. Dawn's plot is unfolding right before our eyes. Thanks for the fiction references Art and, as always, the astronomical updates from bystander. Glad you didn't forget one of my favorites… IA - my favorite among many great choices. After all he originally coined a term describing such bodies. I wonder how much the IAU considered his terminology. Maybe it was somewhere in the "meso"? I do find it hard to take that whole story Siriusly. From an oldie to a modern goodie I'm hoping John Sandford's new sci-fi will be as fun as his crime stories. The plot sounds somewhat like an updated version of famous scientist's trip into an unlikely realm but time will tell. I hope it will be serious fun. 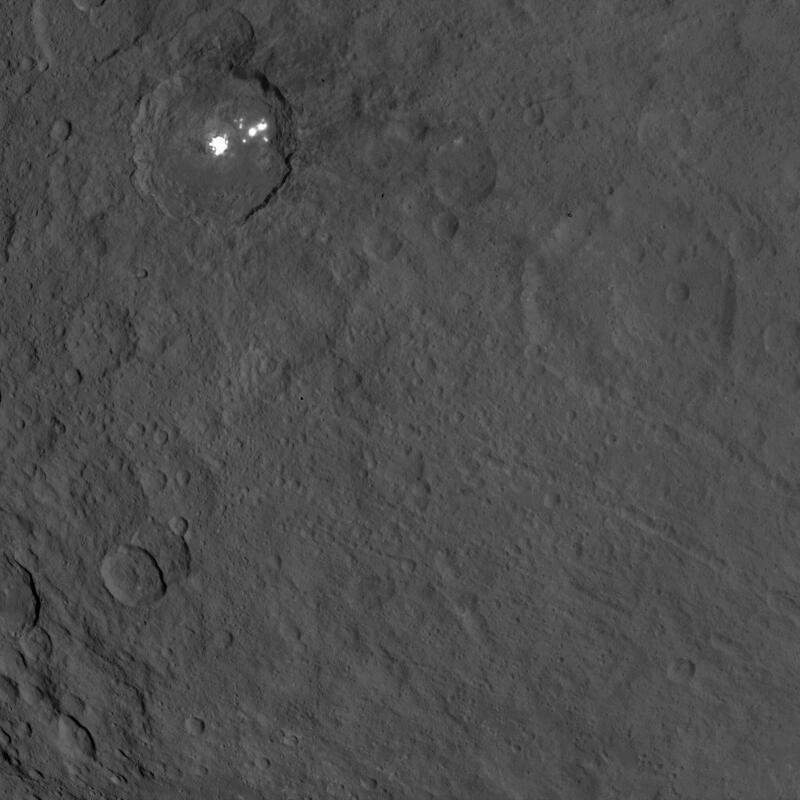 Occator crater on Ceres, home to a collection of intriguing bright spots. All the white spots were formerly unresolved & overexposed. Now, finally, at least the "bland patch" has been resolved and is not overexposed. When Dawn descends further (in December) other "White Spots" will probably be resolved into "bland patches" (after careful reprocessing). 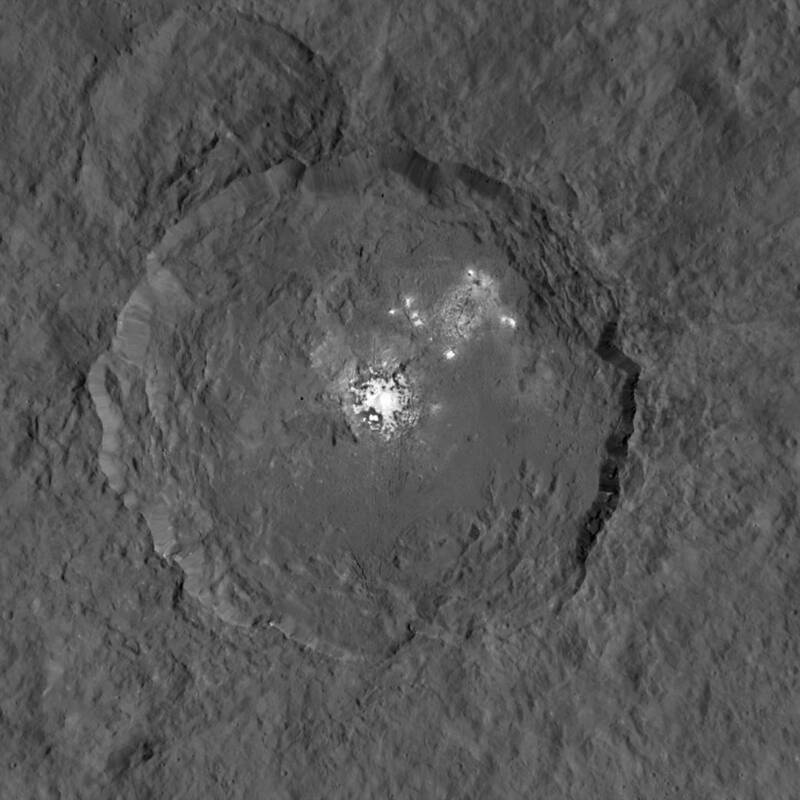 Because these spots are so much brighter than the rest of Ceres' surface, the Dawn team combined two different images into a single composite view -- one properly exposed for the bright spots, and one for the surrounding surface. 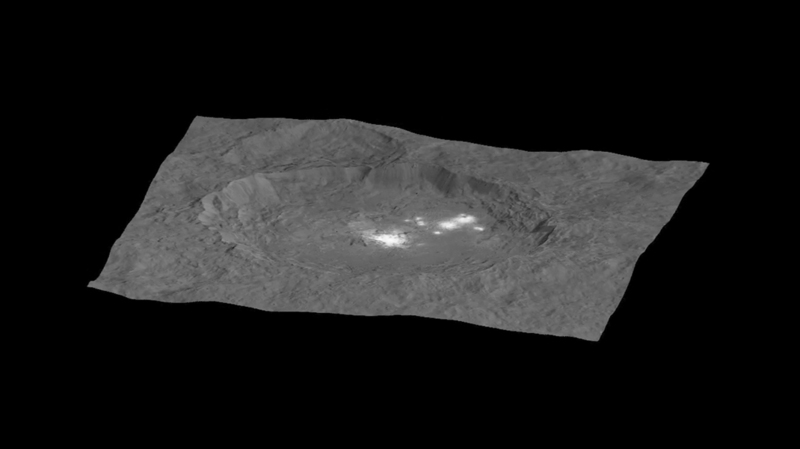 [img3="This map-projected view of Ceres was created from images taken by NASA's Dawn spacecraft during its high-altitude mapping orbit, in August and September, 2015. Ceres, the largest object in the asteroid belt and closest dwarf planet to Earth, had been remarkable for its plain surface. New research suggests that most of the material that has struck Ceres in high-speed collisions has stuck — billions of years worth of meteorite material. A new set of high-velocity impact experiments suggests that the dwarf planet Ceres may be something of a cosmic dartboard: Projectiles that slam into it tend to stick.